We define general purpose coordinates which facilitate computational structure search in cluster and material science. Identification of relevant reaction pathways in ever more complex composite materials and nanostructures poses a central challenge to computational materials discovery. 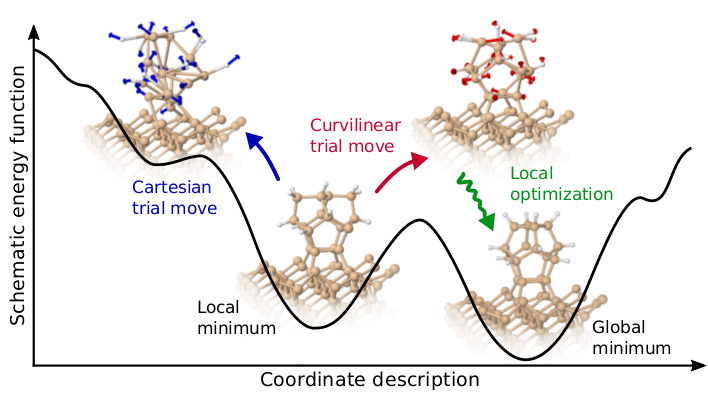 Efficient global structure search, tailored to identify chemically-relevant intermediates, could provide the necessary first-principles atomistic insight to enable a rational process design. In this work we modify a common feature of global geometry optimization schemes by employing automatically-generated collective curvilinear coordinates. The similarity of these coordinates to molecular vibrations enhances the generation of chemically meaningful trial structures for covalently bound systems. In the application to hydrogenated Si clusters we concomitantly observe a significantly increased efficiency in identifying low-energy structures and exploit it for an extensive sampling of potential products of silicon-cluster soft landing on Si(001) surfaces.